Adapted from Chapter 9 of Anne Kursinski’s Riding & Jumping Clinic by Anne Kursinski with Miranda Lorraine with permission from Trafalgar Square Books. 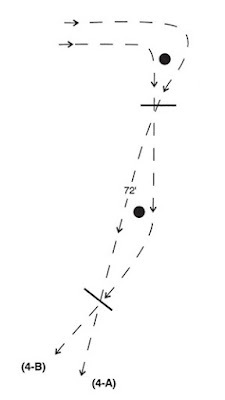 diagonal line (A) or a bending line (B). 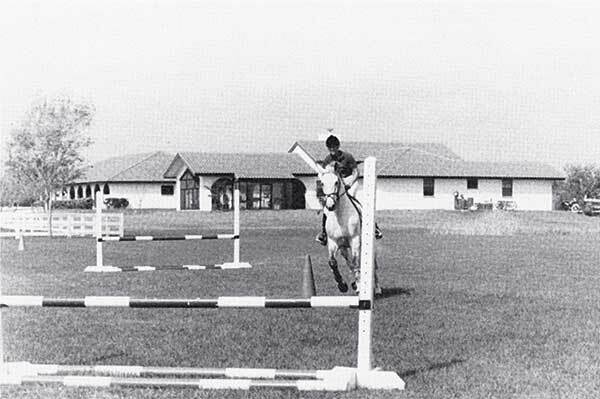 1: Cantering around the cone in the turn makes me see a straight line over the two fences, even though I'm riding to the first fence at a slight angle. Once I find my line, all I need to do is stay on it, maintaining my pace and rhythm. 2: Over this fence my eyes are glued on the center stripe on the rail. 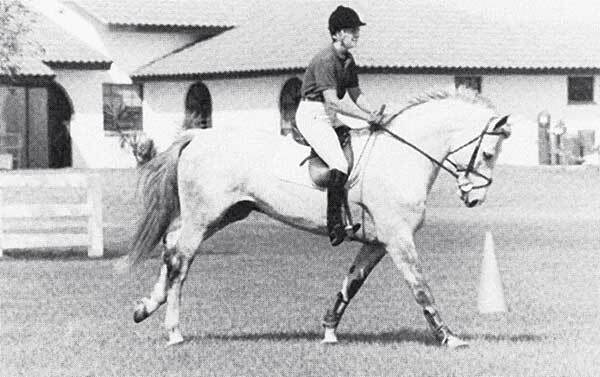 A horse with an average 12-foot stride should easily get five strides in the 72-foot distance. 3: I have my straight line just inside the second cone, on my left. Riding around the outside of the first cone and inside the second has helped me keep my line. There's no need to steer because I made the line way back in the turn and I know the second fence will happen automatically. 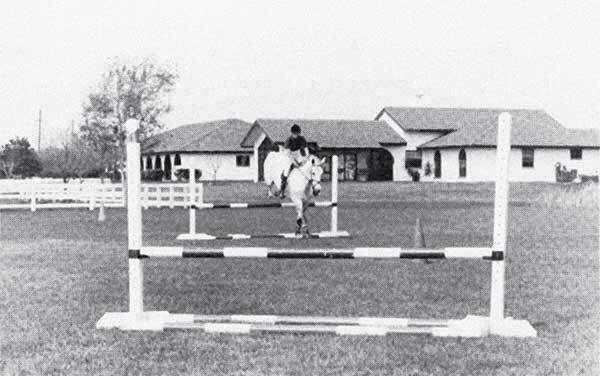 Finish the exercise with a halt on a straight line, evaluate your ride and then repeat until jumping fences at an angle becomes fairly normal and you're consistent about meeting both fences in the center. Now ride the same two jumps as a bending line. At the same normal canter pace, make your turn to the first fence inside the first cone this time so that you meet the first fence at a 90-degree angle. From there, sight the center of the second fence and ride a bending line to it, passing to the outside of the second cone at about the halfway point. 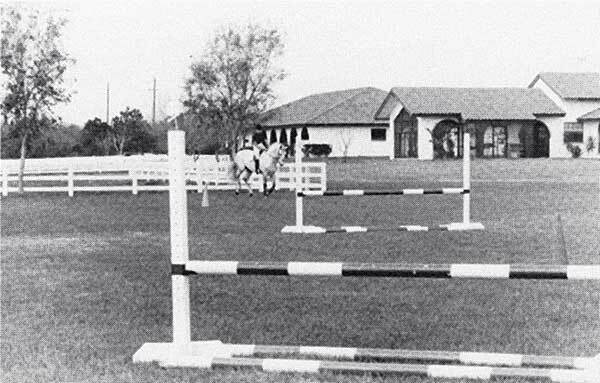 On this bending line, you should comfortably fit in six strides between fences if you maintain your rhythm and pace. 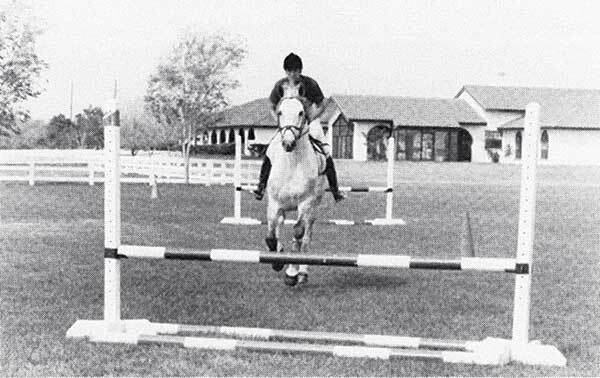 Meet the second fence squarely and in the middle and halt on a straight line a few strides afterward. 1: Way back in the turn - and this time I'm turning to the inside of the first cone - I'm looking straight at the first fence. I also check out where the second cone and second fence are in relation to the first fence. 3: Riding around the cone automatically makes the bending line and it creates a straight line to the center of the second fence. Just as in riding a turn on the flat, if I look where I want to go, I'll get there. As always, I'm counting strides between the fences and as I near the fence I see the six is there. 4: The six strides worked out perfectly, and now I hold my line to complete the exercise. 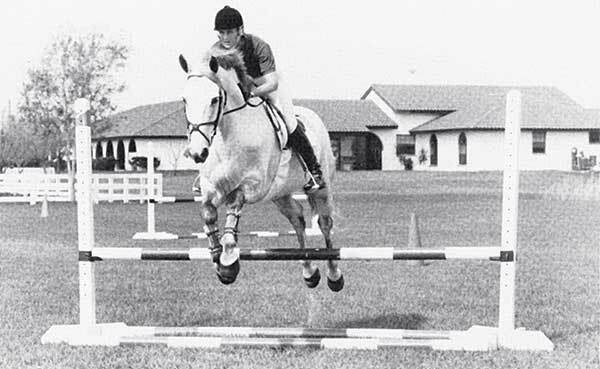 Once you're comfortable with the bending line and the six-stride distance between fences, ride it as a seven. 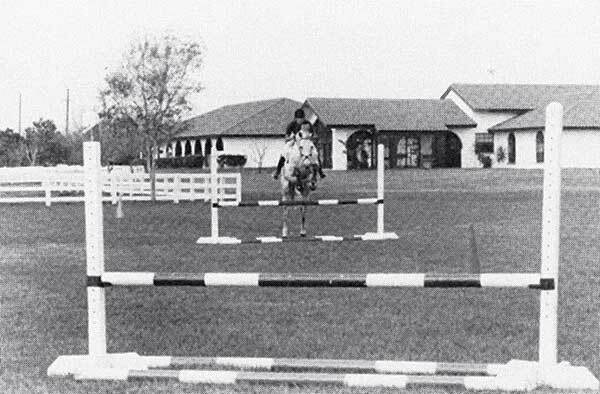 You'll have to start with a shorter stride, which you'll have fully established by the time you make the turn to the first fence. Enlarge your bend just a little to be sure you have enough room for the seven. Again, concentrate on making the trip smooth and remember to learn a little something from each less-than-satisfactory try until you're consistent all the way down the line every time you ride it.